Phantoms fans have a huge part to play in the crunch clash against Basingstoke tonight. Head coach Slava Koulikov saluted the fight of his Peterborough Phantoms players last night - as they set up perfectly a huge title-deciding clash against Basingstoke Bison at Planet Ice tonight (March 4, 5.30pm). The city team came from behind three times before snatching a vital overtime success against London Raiders at Planet Ice last night. Leigh Jamieson’s last-gasp goal secured a 4-3 triumph kept their challenge for NIHL Division One South honours alive as they moved level on points with Basingstoke. Tonight’s visitors have played a game fewer so it’s another must-win game for Phantoms. 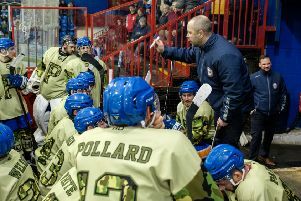 Phantoms head coach Slava Koulikov said: “We made it very clear that we had to take care of business on Saturday before we could think about Sunday. “London came here and made it very hard for us as we knew they would. We’ve played them four times now and every one of those games has been tough. “I know we have beaten them 5-2 and 6-1 away, but the scorelines don’t really tell the story of those games. We were just very clinical in both of them. “Huge credit to the guys for fighting and believing in the way they did. It was a night where they were under pressure and that only increased every time we went behind. But we kept responding and that is great for me to see. “Big games come with big emotions in sport and I think everyone could say that from the way the guys celebrated. We’re all human beings! “Tonight it’s the top two teams, who have been neck-and-neck all season, and it’s the sort of game we all want to be involved in,” added Koulikov. “I don’t see Basingstoke dropping points in their final two games so we have to beat them. We know we need the two points and hopefully we will have everyone behind us. Basingstoke have not played since last weekend after seeing a Friday cup final against Swindon postponed.